Nova Materia release a debut album of ‘electronic desert music’ for the ever trusty Crammed Discs. The duo of Caroline Chaspoul from France and Eduardo Henriquez from Chile formed three years ago, born out of the ashes of alternative rock group, Panico. The duo’s It Comes LP builds on sounds and influences gathered during a 2010 trek by the band across northern Chile. The duo’s performances are described as “primal and futuristic”. 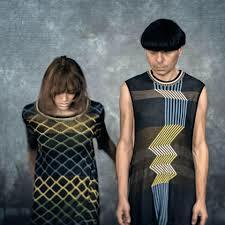 Their sound has developed from their 2015 debut Aparece en sueños, where the duo evolved their industrial and coldwave tendencies with krautrock, shoegaze, and funk. BPitch Control’s Chlóe is cited as a direct influence on their music and the duo worked with Chlóe again to produce two eccentric techno/house tracks, such as ON/AV found on the new album. The album is out now and they are performing at The Waiting Room in London on November 13th.